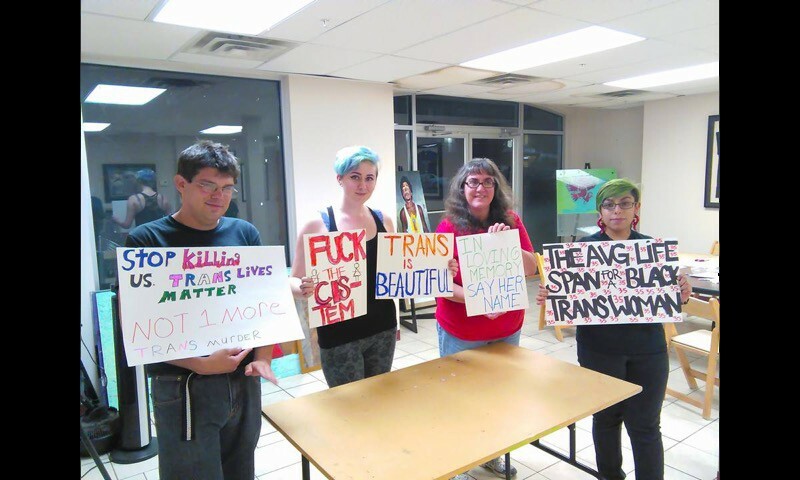 Members of Stand For Queer Lives hold up signs for their upcoming rally on Sep. 3. At 5:30 p.m. on Dec. 28, 2014, Leelah Alcorn’s suicide note was automatically posted to her Tumblr, hours after her death. This note shared Alcorn’s grievance she felt as a trans person, who so often fall into self-loathing and hopelessness due to society’s treatment towards trans and queer people. Alcorn is only one of many trans/queer persons to have died from either suicide or murder in the last year, and the numbers are rising. Utah resident Adrian Romero was outraged by the rising statistics and also with how little the media was concerned about raising awareness for trans and queer lives. In January of 2015, Adrian founded the group Stand for Queer Lives, a support and activist group dedicated to aiding the lives of LGBTQ+ people, especially the youth who have the highest risk of LGBTQ+ suicides, such as that of Alcorn. “I took [her death] really personally,” says Romero, who has dealt with the depression and frustration that many trans and queer people experience. “These terrible circumstances have inspired me in a positive way because somebody needs to do something about it,” Romero says. “A lot of people still don’t even understand what trans is,” says Romero. “There’s a huge intersectionality being a trans person of color. There’s a different culture between white trans and trans people of color, and it’s extremely dangerous to be a trans person of color.” The National Coalition of Anti-Violence found in 2013 that almost 90 percent of LGBTQ homicide victims were people of color. Seventy-two percent were transgender women and 67 percent of these women were women of color. The stats, the news, and our queer youth are screaming the statistics, and SFQL will not stay seated politely and make excuses while lives are diminishing at increasingly rapid rates. Stand for Queer Lives has been growing steadily and expects to contain more members after the rally on Thursday. It is always refreshing to see inspired groups dedicated to enhancing the lives of their community members, and this group has not stopped the momentum since it found its legs in January. If there is one message Romero wants Utah citizens to hear, it’s “Get involved in your community! People are dying! If you think it doesn’t concern you, it will.” Though SFQL is small, nearly 200 are said to have committed to joining their march in the rally. The more we come together as a community, the easier it will be to accomplish our goals of abolishing hatred and intolerance and the closer we will be to living in an inclusive, safe environment for members of the LGBTQ+ community. Stand For Queer Lives will be hosting a rally at the Wallace F. Bennett Federal Building on Thursday, Sep. 3 at 6 p.m. If you, or someone you know, identifies as trans / queer and is struggling with depression and/or suicidal thoughts, or simply need someone to talk to about any issue, there is now a trans-friendly hotline called Trans Lifeline. Trans Lifeline is for transgender people and is staffed by transgender people. The number is 1877-565-8860. Please take care of yourself and those you love, and pass this information along to whomever may need it.